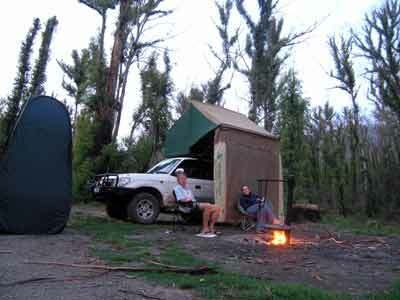 Back in December 2004, Kelly and I attempted to do a trip over the Christmas/New Year period to the Victorian High Country. That attempt ended in disaster, with a wheel of our Prado falling off when doing 110 km/h down the Hume Highway. See my article on that trip for more details. After a few years of spending this period on our diving buddy Mark's yacht on Sydney Harbour, we finally summonsed up enough courage to give it another go. 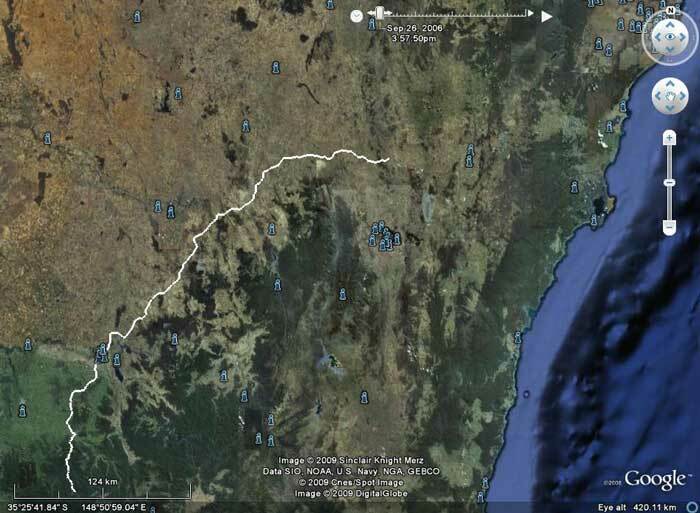 We headed off at 6:40 am from home and down the F5 and Hume Highway. This time we decided (well, Kelly did) that we should visit Jugiong, the town (village?) 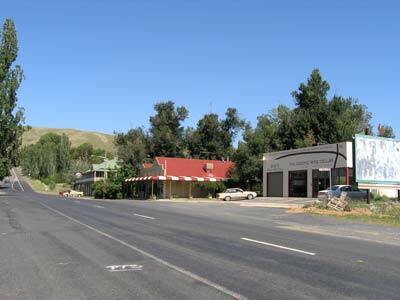 where we were forced to spend five days waiting for the Prado to be fixed in 2004. We arrived in Jugiong at 10:00 am and went past the crummy motel where stayed to the picnic area in the middle of the town (amazingly, it looked like it had a coat of paint and the swimming pool was blue, rather than green when we stayed there. When we first visited, the picnic area and next door council pool were perhaps the only redeeming feature of Jugiong (other than the fact that Richie Benaud, former Captain of the Australian Cricket team and long time Channel Nine Cricket commentator spent his early days here). It is a very nice picnic area and well worth the short diversion off the highway if you want to stop for a break (the only shop selling fast food is the service station on the northern end of the village). However, when having our morning tea we noticed a couple of changes. The small store was now a cafe (The Long Track Pantry) and the building next door was a winery outlet (The Jugiong Wine Cellar) and a fruit shop next door. After we finished our tea and coffee, we walked across to the wine shop and found that it only sold local wines. This was brand new and only opened about the 20 December 2007. We purchased a bottle of wine grown at Jugiong for $15.20. We went and looked at the cafe but it looked like it was not going to be open on Boxing Day. We were back on our way at 10:30 am and at 12:50 pm we pulled into Albury. There is a new freeway that bypasses the town so you now need to pull off this to get fuel and food. We refuelled here taking 78.8 litres at 135.9 cents per litre for a total cost of $107.05. Fuel economy for the 634 kilometres since I last refuelled (67 kilometres were in Sydney before we left home) was 12.4 litres per 100 kilometres, pretty good considering we have averaged 97.4 km/h for the 552 kilometres since home. After refuelling we left at 1:05 pm. 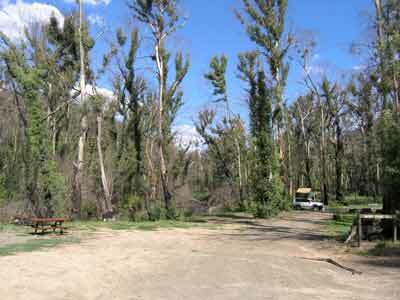 We had planned that on the way out of town we would stop for lunch at a nice picnic area. However, we missed a very good one just after the service station as we were in a left turn only lane and you had to go straight ahead. We never saw another spot as we went through Wodonga and we ended up stopping at 1:30 pm at a very poor spot out in the bush at an intersection. At 1:45 pm we restarted our journey and travelled via Beechworth to Myrtleford where we arrive at 2:20 pm. After a very quick look around town and a quick trip to the supermarket by Kelly to get a couple of things we forgot, we head out to the south of town on the Buffalo River Road. This follows the Buffalo River (naturally) and we cross the dam wall that creates Lake Buffalo. This is overflowing after extremely heavy rains a few days before Christmas. 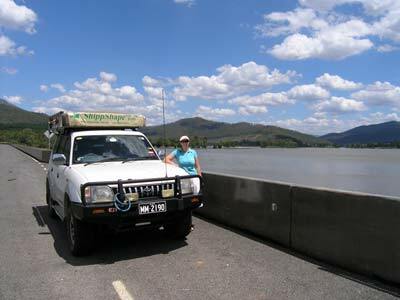 The road turns a little to south-south-east and about after about 38 kilometres we come to Tea Tree Camping Area, the first of a few camping areas that are located on the river. This is quite nice. 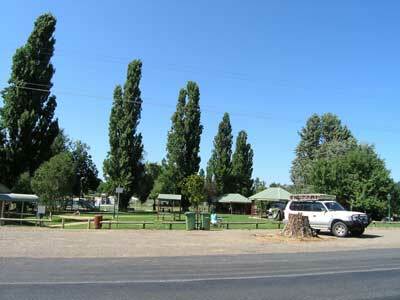 A further kilometre down the road is Manna Gum Camping Area which is also nice. 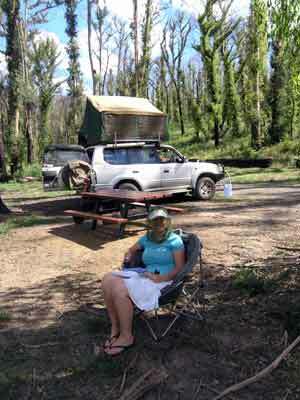 We had planned to camp at the Abbeyards Camping Area which is 52 kilometres from Myrtleford but when we arrive we find one spot up on the road and two spots down on the river. Both the river spots are taken and the top spot is not as nice. We decide to head on south. Blades Camping Area is also here. We arrive at McIver Camping Area a few minutes later at 3:40 pm. This is also on the river and is at the intersection with Abbeyards Road which we plan to take first thing in the morning. 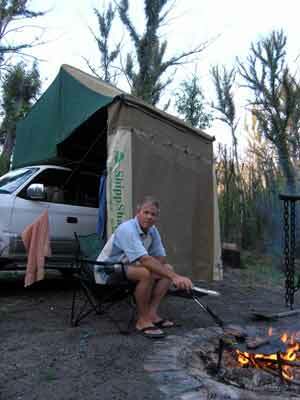 Like all the sites along here, the Camping Areas have BBQs and tables. 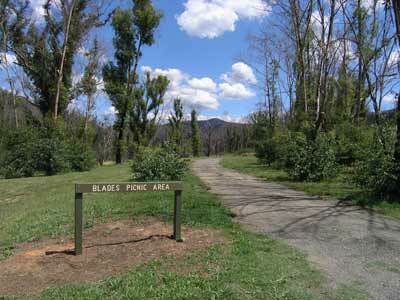 This area was burnt out in 2006-7 during the bushfires that raged across the rest of the high country that was not burnt in January 2003. These changes appear to make the set up better as we can carry food items without cramming it in. In addition, the battery is reading 13.00 volts as we arrive, well above what it has been on previous recent trips. The evening is nice but noisy. There are millions of cicadas here, all chirping as loud as they can and peeing all over the place (it looks like it is raining at times). There are also frogs in the river croaking a lot. The flies are plentiful, but we will strike worse later in the trip. We go for a walk up a track that comes off the main road before the Camping Area. This leads to an old timber bridge across the river that was burnt out in the fire. Another car arrives later with Rob and Nola from nearby Wodonga. We talk to them and end up having a drink with them before dinner. After a long day of driving, we refresh ourselves with a hot shower before dinner. We have a few beers and wines as we cook and eat our steak, sausages and pasta. We read a bit and have an early night, in bed by 9:30 pm. Weather: Fine, maximum temperature about 30ºC.